Reeves, 74, a former police captain and former amusement park security director, is accused of shooting and killing 43-year-old Chad Oulson on Jan. 13, 2014, in Pasco County, Florida, before a showing of “Lone Survivor,” police said. “At that point, it was his life or mine,” Reeves testified, when asked by the defense why he shot Oulson that day. If Circuit Court Judge Susan Barthle rules in favor of Reeves, he will receive immunity from prosecution and will leave the court a free man, with no criminal murder charges, under Florida’s “stand your ground” law. 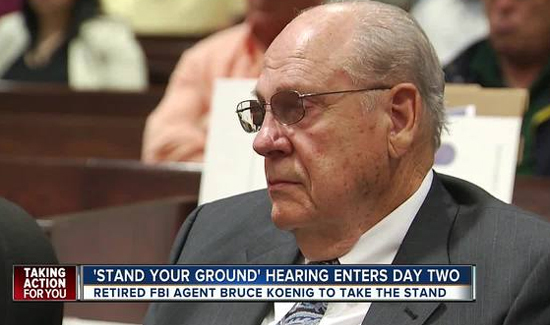 Should she decide Reeves did not meet the law’s criteria during the encounter with Oulson, he will proceed at a later date to a criminal trial, where he may claim self-defense but may not utilize protection under the “stand your ground” law. Prosecutors say Reeves provoked the confrontation, The Associated Press reported — which would exclude him from protection under the law. Before the shooting, Reeves complained about Oulson’s use of his phone to movie theater employees, authorities said at the time. When Reeves returned to the theater, the argument escalated. Witnesses told police that Oulson threw a container of popcorn at Reeves before being shot, police said. Oulson’s wife, Nicole Oulson, was also shot, in the hand. She told ABC News in 2014 that her husband was texting their babysitter, who was watching their young daughter. “I said, ‘You’re not on your phone. Sorry I involved theater management,'” Reeves said. “When I looked up, he was coming over the seat at me, across the front of where my wife was … and I was hit in the face,” Reeves said. Reeves said Oulson hit him over his left eye, knocking his glasses to the side of his head. Reeves said he could still hear Oulson yelling, using profanity and saying that he was texting his daughter. Reeves said he tried to get out of his seat to stand up but could not because he was still holding on to a container of popcorn. He said he tried to lean back in his seat to create distance between him and Oulson but there was a wall behind his row of seats. Reeves said he could see Nicole Oulson trying to hold back her husband. Reeves said that at some point he reached for his .380 semiautomatic handgun, which was in his pants pocket. “There’s a thing where you see somebody getting ready to set up and to punch you, and he was getting ready to punch me, and I perceived that at some point … That’s when the pistol came out,” he said.